ARRIVAL TIME FOR OUR LUXURY PLATINUM HOLIDAY HOMES IS ANY TIME AFTER 1PM. DEPARTURE IS BY 10AM ON DAY OF DEPARTURE PLEASE. 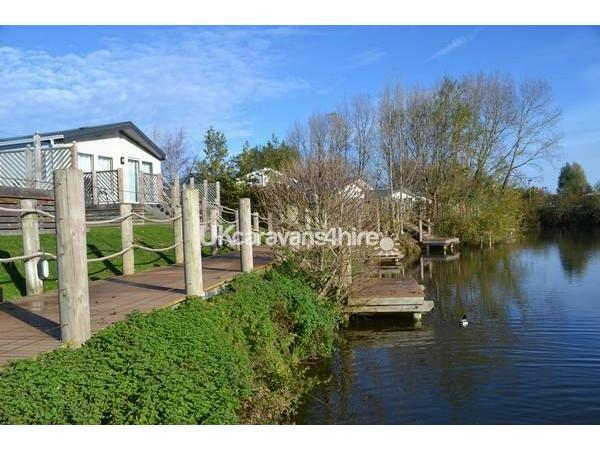 At 40ft x 20ft this Luxury Platinum Willerby Boston Lakeside Lodge is double the size of a normal holiday home. 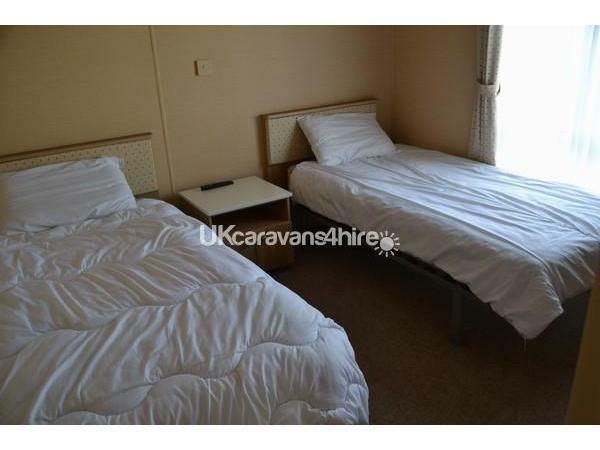 Two bedrooms - 1 king size and 1 twin with two full-size single beds. Sleeps up to 4 guests comfortably. Generous overhead lighting and lamps to suit all moods and occasions. 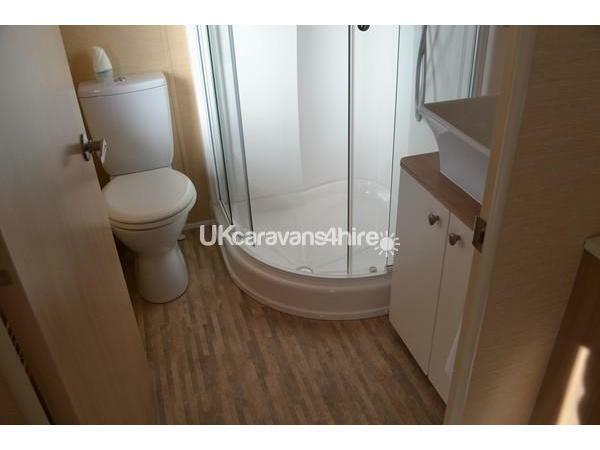 Two bathrooms - ensuite to master bedroom with shower and family bathroom with bath and shower over. 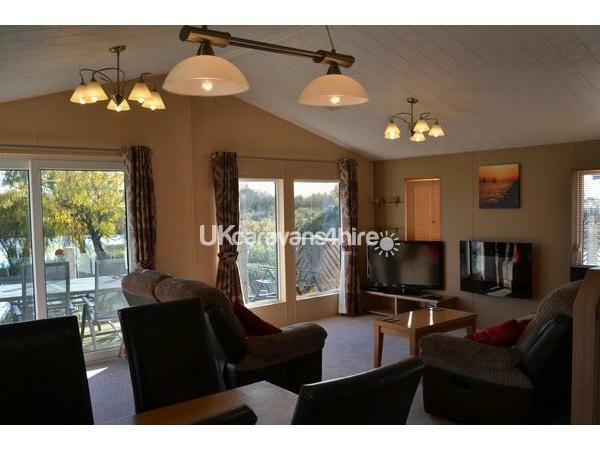 Large, open plan living area. 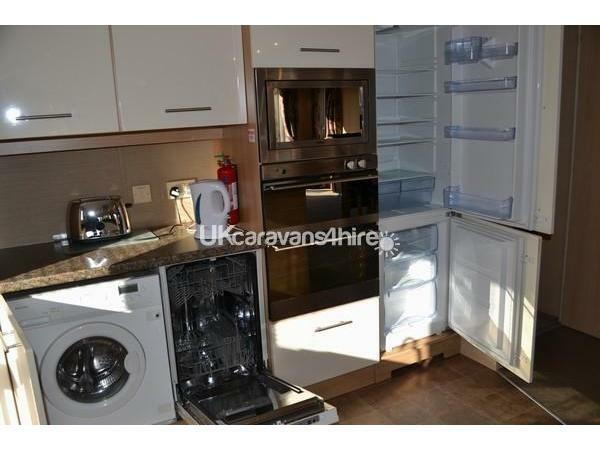 Well fitted kitchen with full size appliances including dishwasher and automatic washing machine/drier. Dining area with large dining table and chairs. UPVC double glazing and central heating. Feature electric fire in lounge area. Sliding patio doors opening on to a huge gated wooden raised veranda deck with garden furniture. 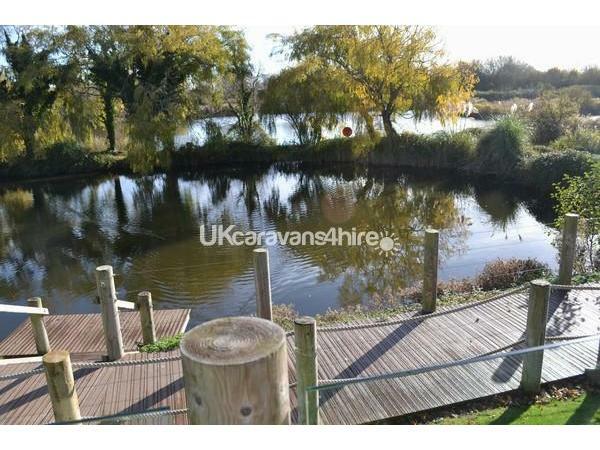 Direct access to private wooden lakeside boardwalk. Paved patio and spacious lawned area. 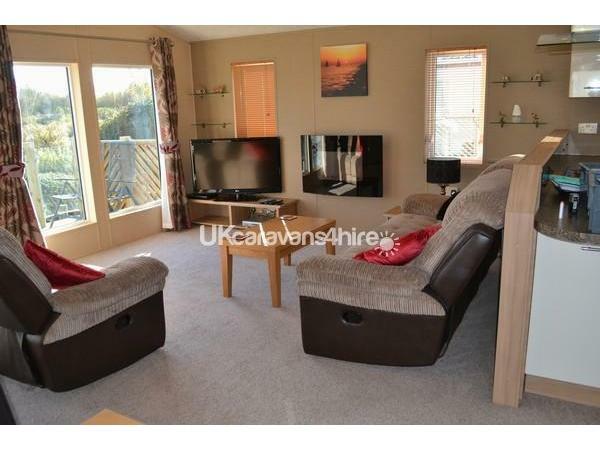 Flat screen TVs in every room / Sky TV in living area. Free fishing from your own private fishing platform. Good overhead lighting and lamps. 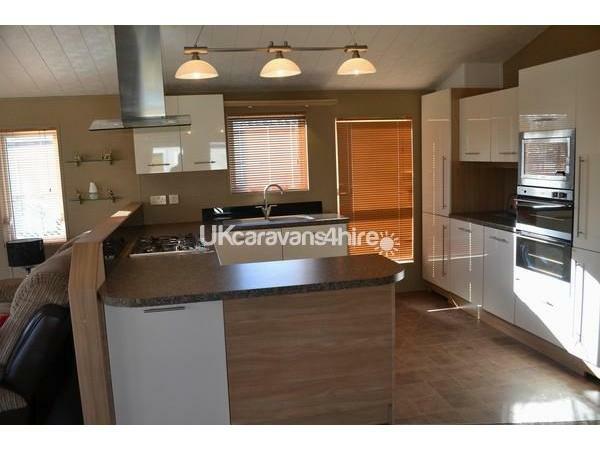 Well equipped, modern kitchen includes a full-size appliances - gas oven and 5 ring hob with overhead extractor, microwave, kettle, toaster, integrated family size fridge and seperate freezer, dishwasher, automatic washing machine/drier and all the pans, crockery, glasses and utensils you need to cater for family meal times. 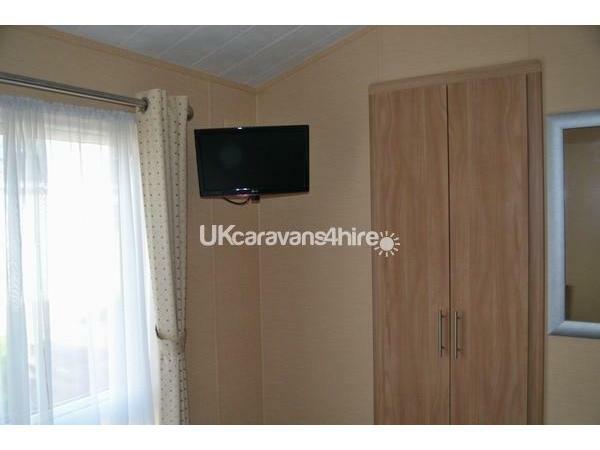 Wall mounted flat screen TV with remote control. Dressing table area with mirror. Large walk-in wardrobes with coat hangers, drawers, bedside cabinets and lots of extra storage. 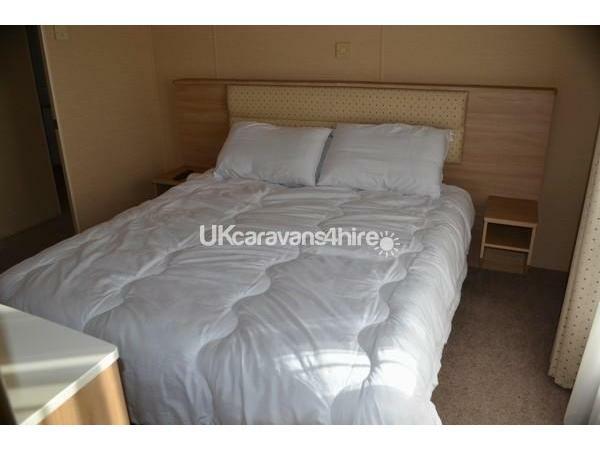 Two full size single beds. 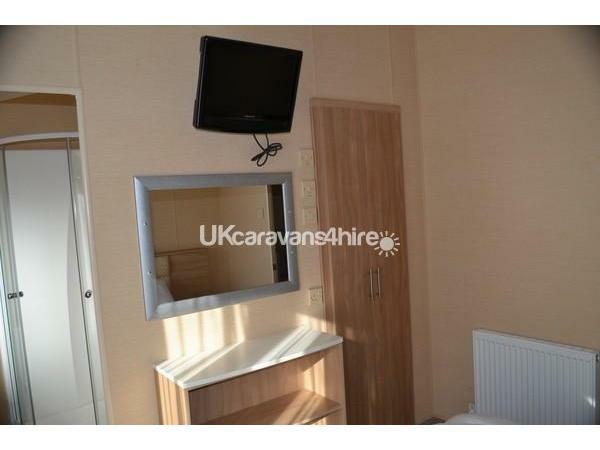 Bedside table, spacious walk-in wardrobe with coat hangers, shelving with mirror over. Bath with shower pver, hand wash basin with mirror and toilet. Sliding patio doors from the living room open on to a huge gated wooden veranda deck with direct access to the private wooden boardwalk and your own fishing platform with free fishing. 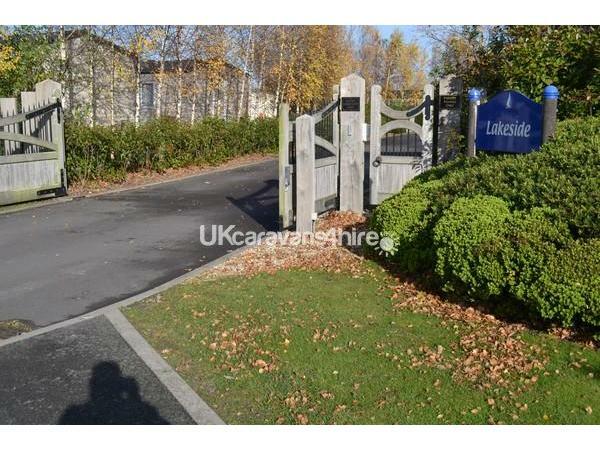 Located in a prestgious private secure gated area of the park, shared with just 8 other lodges. Private car parking spaces directly outside the door.